They were so scared they couldn't stop squeaking. 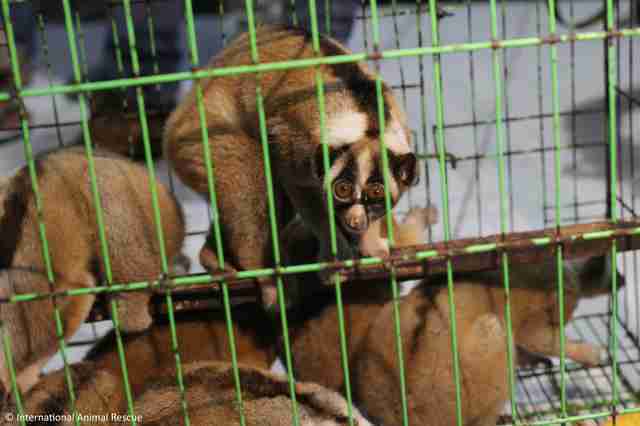 The slow lorises wrapped their hands around the metal bars of their filthy cages and peered out with wide eyes. Some of the slow lorises let out high-pitched squeaks - which they only do when they're scared. 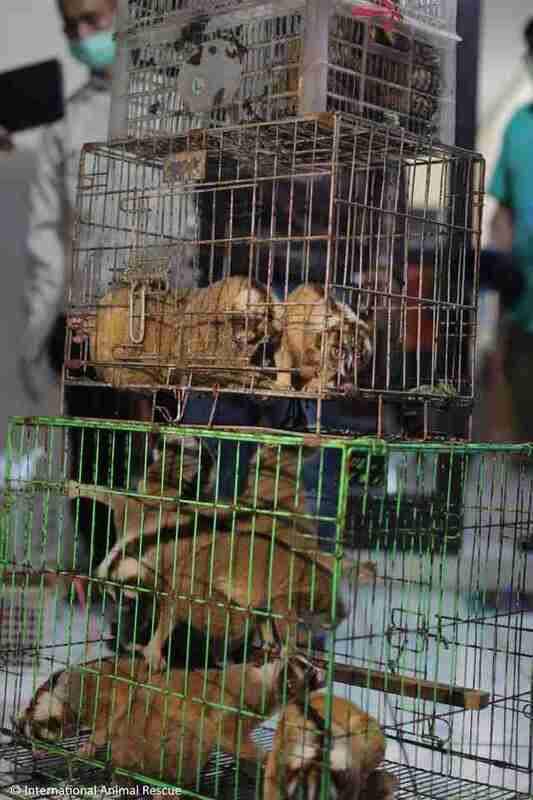 This is what police found when they raided the home of a wildlife trader in Manonjaya, West Java, in Indonesia earlier this week - 14 Javan slow lorises in three cages, bound for sale in the illegal pet trade. Six of them were female, and seven were male. 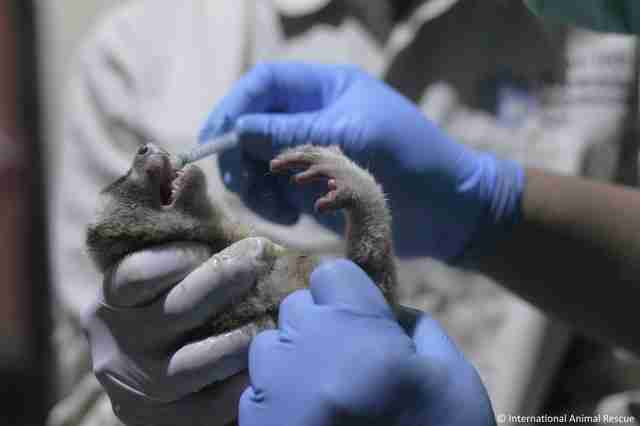 Police also found a tiny baby slow loris whose gender couldn't yet be determined. 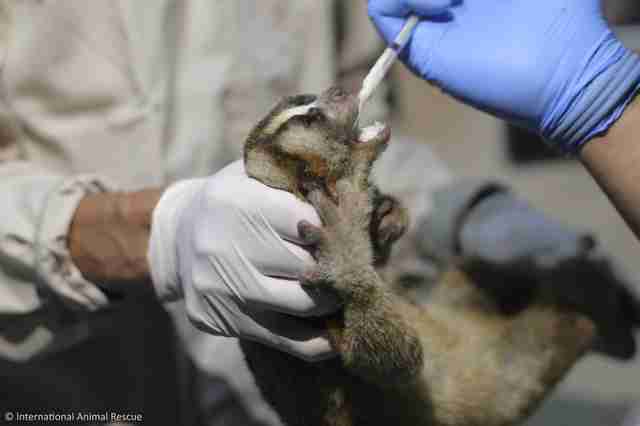 The police got in touch with the medical team at International Animal Rescue (IAR), an organization that rescues and rehabilitates wildlife, and the IAR team quickly arrived to help. The animals were terrified, Lis Key, PR and communications manager for IAR, told The Dodo. 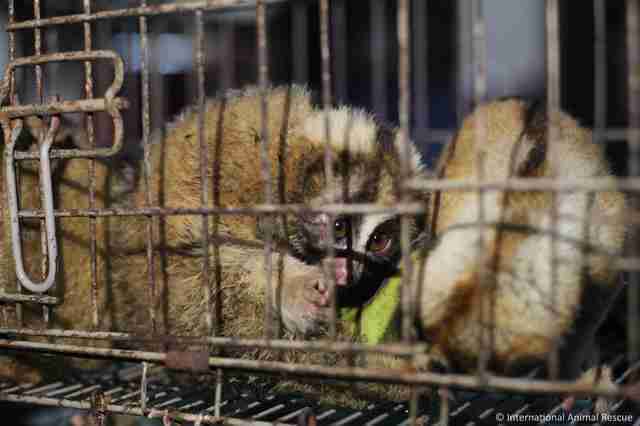 "Slow lorises are solitary, nocturnal primates, and so everything about the experience of being captured and stuffed into a small cage with other lorises must have been deeply traumatizing," Key said. "The very experience of being handled and moved around in daylight would be extremely stressful after the quiet, dark shade of the forest." It was the first time Key had ever heard lorises squeaking so loudly. "They cry under stress, which of course they were certainly suffering from after all the trauma they had been through," she explained. "They sound quite pitiful, poor little things." When the rescue team examined the animals, they found that many of the slow lorises had injuries, which were probably caused by the other slow lorises. "Being together in such close confinement will have caused them to panic and fight with each other for space and air," Key said. "Lorises do not tend to live in close proximity to others - unless they are members of a family group. So a loris that finds itself forced into a small space with other lorises will fight to defend itself and ward off attacks from other lorises." 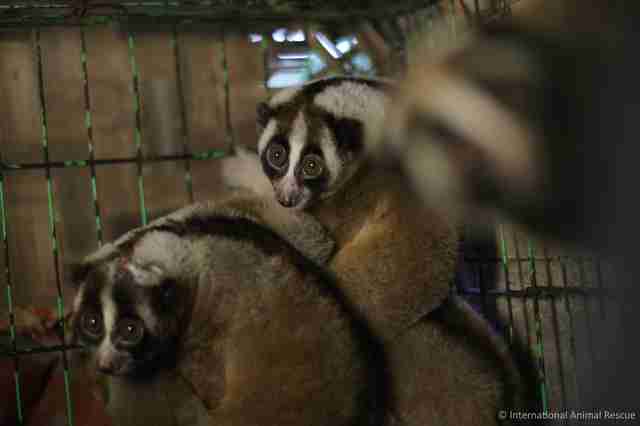 Taking slow lorises out of the wild isn't just cruel - it's detrimental to the species. The International Union for the Conservation Of Nature (IUCN) lists the Javan slow loris as critically endangered, which means the species is facing an extremely high risk of extinction. Other slow loris species, such as the greater slow loris, are listed as vulnerable. 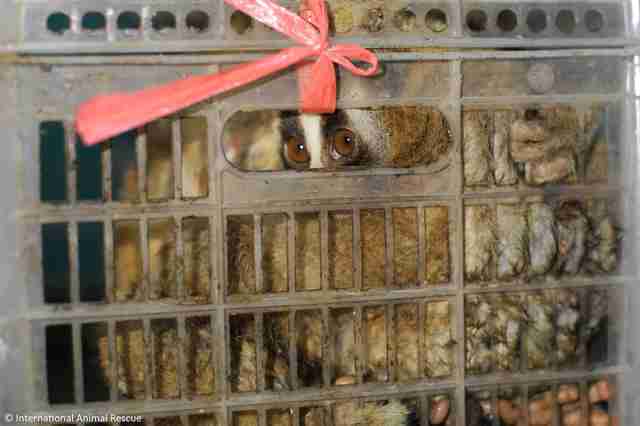 Despite their conservation statuses, slow loris species continue to be trafficked and sold into the pet trade. 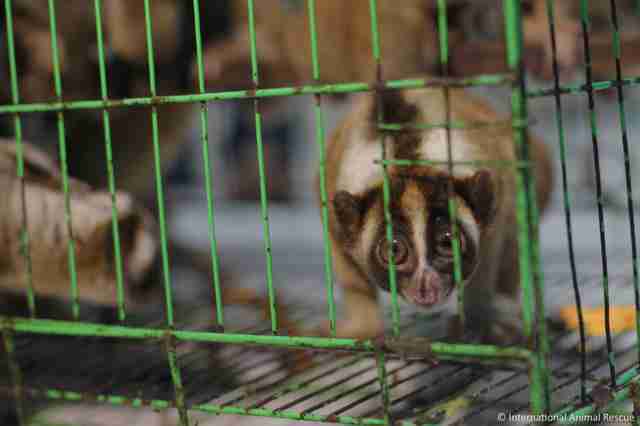 It's estimated that 200 to 250 slow lorises are traded each year just in Indonesia, according to IAR, and that 30 percent of slow lorises die during the trading process. 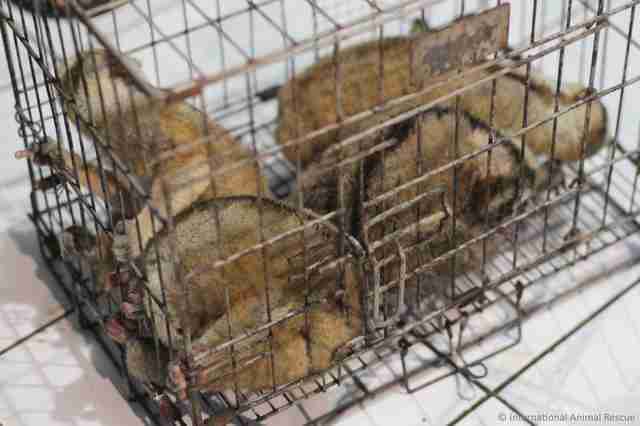 "Illegal hunting and trafficking for the pet trade are pushing the slow loris perilously close to extinction," Karmele Llano Sanchez, program director of IAR Indonesia, said in a statement. "If the species is to survive, it is vital that the trade is stamped out. It causes immeasurable suffering to individual lorises and poses a grave threat to the survival of the species as a whole." 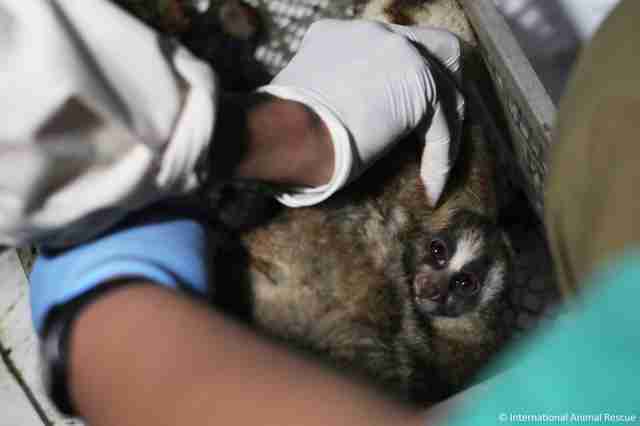 At the IAR medical center, the slow lorises were treated for dehydration and diarrhea, as well as extreme stress. Thankfully, the slow lorises' teeth weren't removed, which is something that's often done before they're sold as pets. When the slow lorises make a full recovery, they'll be released back into the wild. "We are hugely relieved that they have survived thus far," Key said. 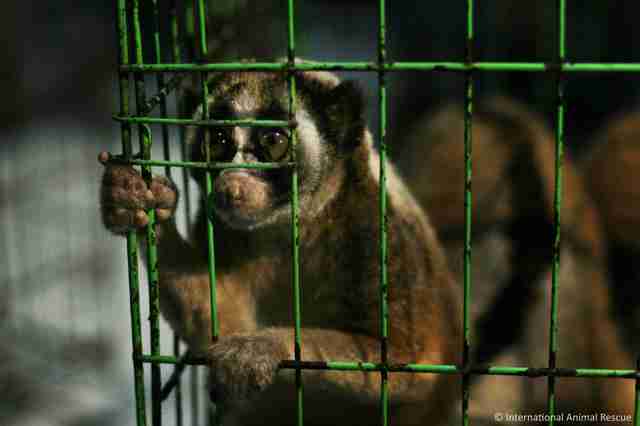 "But lorises do suffer badly from stress and trauma and so they are still not in the clear. Time will tell whether they all survive. Certainly our vets and caregivers are doing everything they can to ensure that they do."